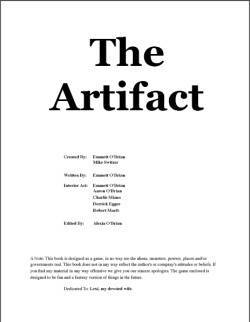 The Artefact by Emmett O'Brian and Mike Switzer is one of those rare epic science fiction roleplaying games that draws you in. Reading it is like watching the Lord of the Rings trilogy back to back, it takes effort, you have to persevere but it is ultimately rewarding, enjoyable and you miss it when its over*. The Artefact doesn't try to reinvent the roleplaying wheel, instead it gets covered in Chobam Armour, powered with Liquid Carbon Fuel and fixed with a particle cannon. The Artefact, which gives the game its name, is a huge elliptical artificial 'planetoid' that sits perfectly between the two stars of a binary system. On this suppository shaped world live three humanoid races: the Scimrahn, who are the underdogs; the Kelrath who love a good fight and to hunt the Scimrahn; and the Chezbah who are ruled by Loc - an intelligence that spreads over half the Artefact. When humanity turned up (having escaped an overpopulated and ruined blue marble), the Artefact's cultures were already going at it hammer and tongs. We only made things worse by bringing our own form of war and disease too. Hurray for us. Humanity quickly allied with the weakest culture (idiots, did they never play Sid Meier's Civilisation?) - the Scimrahn. You play in these early days, fighting off the brutal Kelrath, building more teleporters to Earth, discovering new technology on the Artefact, growing relationships with the Chezbah and working out what this Loc intelligence they believe in actually is. Being plopped onto the Artefact at this delicate time is a wonderful starting point - you're not the first discoverers but instead dealing with the difficult bit that comes after. Or any kind of operetta, space or otherwise. This is science fiction. The Artefact is incredibly well thought out from scientific, ecological, socialogical and evolutionary standpoints. Its unusual shape leads to a irregular gravity and pressure and ecology to go with it. The bi-product of which is some interesting game play and racial differences. The superstructure of the Artefact is described without omission too, bringing everything to life. It is this exceptional detail, all described with copious images that suspends disbelief beautifully. Character generation has an old-comfy-sweater-dug-out-of-the-cupboard feel to it. Your character is defined by 11 attributes: Constitution, Strength, Agility, Reflex, Dexterity, Beauty, Charisma, Intuition, IQ and Psyche. Each is randomly rolled using 1D6 x 10. Hit points are calculated by Constitution and Strength. You flesh out with occupation, age, hair colour, eye colour, underpant colour and so on. There are two very interesting facets of a character: Stress and Fame. Stress indicates the likelihood that your character will develop some very nasty mental illnesses and Fame gives you positive (or negative) control over NPCs by augmenting your Charisma. Stress and Fame rise and fall depending on what you do in game. Experience is awarded for enriching the game at the table, which I applaud. There is a chunky list of skills to choose from (and be assigned by occupation). Character creation is a crunchy process where reaching for a calculator (be it a clunky button one, your iPhone, iPad, iHat, iDesk or iUnderpants) might speed things up. This crunch is of the acceptable kind: calculations that will make play easier and avoids lots of calculating during play. 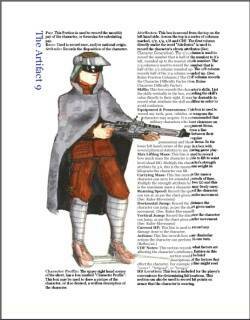 Occupation is a combination of choosing a reason for being on the Artefact and character class. It is easy to imagine an interesting player team made up of the following groups: The Artefact Study Organisation (ASO) is an Earth-born multinational scientific and political group who tread carefully on the Artefact. The Indo-China Alliances (I-CA) are another Earth group who think that colonisation is all important and hang the consequences! You can also be part of the indigenous Scimrahn Culture, who are fighting for survial and finally, you can be a corporate lacky. The ASO have a good mix of military and 'soft skill' (not butchering and murdering) character classes; the I-CA is all about shooting first, denying everything and having Wikileaks publish it; the Scrimrahn have some war and locally useful characters; and the Corporate characters are military, scientific and commercial. In all, there is a broad set of options to draw from. While avoiding tooth-breaking crunch, the system has enough marrow to warrant a good gnaw. Action resolution is a typical roll-under Attribute + Skill + Modifiers on a d100. When you pass, you can pass by degrees. The more you roll under your skill, the better the outcome will be. This is controlled by a terrifying-at-first fraction column but it will be quite simple during play. Combat uses initiative to decide order of play and you declare in order and resolve together. Each turn you have a number of actions to do and have fewer options if you fail your initiative check. Combat is highly evolved and lethal. You can punch someone to death in a singly round and hit locations include groin. You can dodge bullets up to point but you will get washed away if there is a flood of lead and laser. 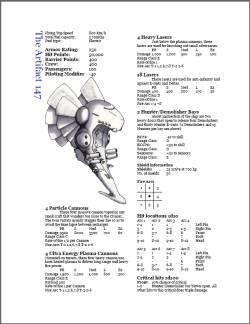 There are rules for waving heavy objects around (thinking more claymore than majorette) and mob rules for handling group combat. I've always had difficulty with combat of huge groups but this system seems good - taking a leaf from wargaming by treating many units as one. Mental combat is brilliant and can give you psychosomatic diseases, disorders, neurosis and more. This is where the Stress Attribute comes in and its an idea I love to bits. Unlikely Call of Cthulhu, you do get a chance to deal with your stress levels and their associated neuroses. There is no descent into the realms of the jabbering neuroticism unless you're one of my players, which is where you begin. If you though that might be enough rulings then hold onto your hats, there's more. You can contract diseases, encumbrance rules and an extensive vehicle combat section. ...pages and in a small font too. That's a large book and yet it's packed with well thought out details. 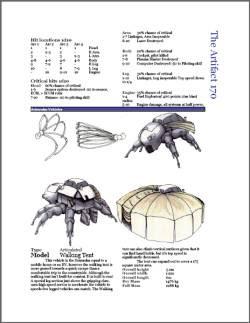 There is also a bestiary; GM Section; large number of vehciles, weapons and gadgets; rules for making modifications to equipment; its own alphabet (no, really); quick reference tables and maps galore. The Artefact is a large game. 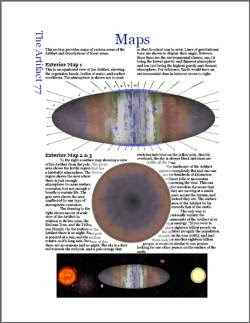 If you were to print it and lob it into orbit around Jupiter then someone would definitely send a probe out to it. I should mention the images within because they're delightful. Emmett, Aaron, Charlie, Derrick and Robert have donated a beautiful array of evocative and colourful works that break up long sections of text and help pin down the style of the game. They are proof that a huge amount of thought and effort has gone into The Artefact. My largest concern with the Artefact is how easy it is to get into and sadly I am unable to espouse a single smart-arse solution for it. I spent four evenings in total reading it through but then I know I'm a strange and biased beast, it's rare that I get to read epic science fiction like The Artefact that isn't my own. It's large and the authors know it. There could be some better descriptions of the Artefact before the maps, the typography is a little hard on the eyes (and downright wonky in places) and the image placement could be tweaked to improve readability. I would add an index and increase the granularity of the page. I would split out some of the rules and mark them as optional. I know Gamesmasters would do this anyway but I would help the budding GM by indicating those pieces that are not core to the game (Stress is far too core to left out, for example). The book could be re-ordered into more easily digested sections and some pieces could be fired into an Appendix. Yes, alright, ok ok, I can't help it. I'll suggest having a look at my guide to organising a free RPG. It deserves to have a lovely cover made for it. One couldn't write The Artefact: it could only have been evolved through thousands of hours of play and replay. A huge amount of thought and effort has gone into creating and then playing the living crap out of it. You can tell because it is tighter a boa constrictor's cuddle. It all slots together beautifully like a humongous puzzle. To make something this large, this complete is a stupefying feat. You might not like the crunch, then take the setting - it's one of the best explained pieces of novel RPG science fiction I've seen in a very long time. * There's no 20 minutes of annoying tearful hugging at the end. Thanks Rob for a great review. I'm all jazzed after reading it! hey some of us like hugs!